Designed to meet your daily usage with body of 6.9*3.5*1.9 inch, perfect hold big phone and 100 note. 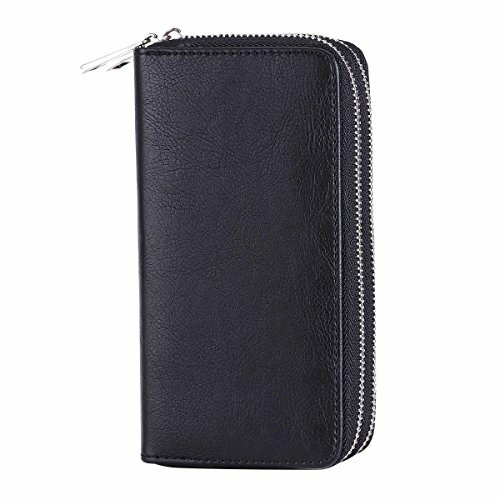 2-layer zip wallet guarantee separate compartment for your cash and extras, ample place to hold your private staffs. 2 Cash Compartments, 1 Cell Phone Pocket, 1 Coin Zipper Pocket, 5 Card Slots, 1 Secret Note Compartment. one bag to hold all your cards, cash, coin, photo, ticket, license, VIP cards, keys, etc. Provides excellent protection and prevents scratches, finger print, dirt and daily wear and tear from accumulating on your phones and card. Suit for Iphone 8 Plus / Iphone 8 / Iphone 7/ Iphone 7 plus/ iphone SE/ Iphone 6 Plus/ Iphone 6S Plus / Iphone 6 / Iphone 6S/ Samsung Galaxy S7 / Galaxy S7 edge / Samsung Galaxy S6, Huawei, Xiaomi, etc. Great buy for yourself or as a gift for her on Birthday, Anniversary, Mother'Day, Thanksgiving, Christmas, New year. Lady wallet suit for casual daily life, classic and practical gift for mother, wife, girlfriend, daughter. If you have any questions about this product by HAWEE, contact us by completing and submitting the form below. If you are looking for a specif part number, please include it with your message.